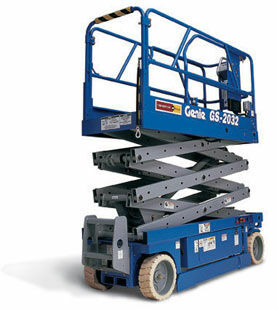 Scissor lift batteries enable industries to reach for the skies and work safely at any height! Scissor lifts provide workmen with a sturdy, safe environment to carry out their daily tasks. Scissor lifts are such an integral part of many working environments, it would be hard to imagine a working day without them. The continual, daily use of scissor lifts, means they have high power demands. This power is reliably provided by scissor lift batteries. Scissor lift batteries come in many sizes and power ratings. A scissor lift battery should also be as high quality as possible to cope with the daily working demands. Scissor lifts place high demand on the battery due to the constant high drain nature of the application. It is important that a high quality battery is used in these appliances to ensure continued reliabilty and so that you can avoid losses due to machines being unavailable for use.